November 2011 was an anniversary of sorts. It marked an era that began 80 years ago in Lansing, Michigan, when, on November 3, the first of three Amos boys was born. The city has never been the same since. 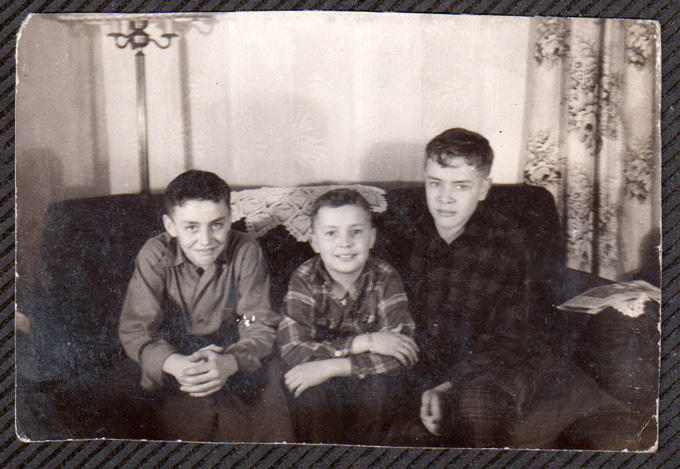 The Amos Boys—Duane, Bruce and Jerry—were born in the 1930s, a time when economic depression commonly forced families to do uncommon things in order to survive. Since then, the world has created history in ways no one could imagine. The Amos Boys have created their history too. These guys have some great stories to tell — a few hard times, lots of fun times, and all of them meaningful times. So in 2012, we did a blog. Every Monday I called Duane, then Jerry, then Bruce, and I merged them into a conference call. I then added an audio recording because I learned pretty quick there’s no way I could write fast enough to keep up with their conversation. Each Friday’s post is a small representation of what we talked about on Monday. I’m sure I missed a lot, so be sure to ask questions and add to it with your comments. It’s like Jerry says, when you all sit down at the table and start reminiscing, you jump all over the place, kind of like a mosaic. Yep, that’s what this blog is—a mosaic of conversation and memories. Enjoy! What a wonderful idea! It’s really cool how you are using technology to gather the memories and then share it with others. I bet that the Monday call’s are the highlight of the week for the three brothers. Thanks Sheryl! Yes, Monday mornings are lots of fun! I found your blog while looking for information about my ancestor Dr. Peter Laing. (I’m descended through his daughter Laura Jane. I’d like to use some of your photographs, but would like to get your permission. I’d be happy to chat about and exchange information as well. Morning Pat, So nice to hear from you! And so nice to meet new kinfolk – no matter how distant! :-) You’re welcome to use photographs, however please let me know which ones and for what purpose. I ask simply because many photos on my blog are personal and current (within the last 50 years). I received permission from family members to use them, but not necessarily to pass them along. Are you doing something online with your research? I’d love to see it, if you are. We found our yearlong blog to be great fun and a wonderful means of drawing the family together. We had a reunion last summer and are having another this year. However, my foremost goal was to provide a history for our kids and grandkids that coincided with their way of communication. Is this blog still current? I’m descended from Jochem Gulick’s eldest child, Hendrick (named after Jochem’s father based on Dutch tradition). Our ancestors also came to Michigan in the 1800s and settled in Gratiot County. Today we’re all over the place, but some of us still get together once a year for the reunion which was started in 1891 by my 2nd great grandfather Dr. Thomas Jefferson Gulick. As the current reunion secretary, I send out a newsletter twice year. I would love to hear from you! Mae Jean, thanks for contacting us! This blog was a yearlong project for my father’s 80th birthday in 2011. While we’re no longer adding to it, it’s still online (obviously:-) and we have frequent readership. How exciting that we may be related! I’d love to receive your newsletter and will message you with my email. Also, are you on Ancestry.com? We should connect.